CMTS Youth Performers Concert 'MttA': Last Performance Sold Out! The last Performance of the CMTS Youth Performers Concert 'Music Through The Ages' has sold out. If you turn up at the 5pm Performance without a booking you will NOT get in. There are still some seats left at the two earlier Performances, but please book. The clocks go back tomorrow morning (Sunday) so please do not be late for the last 'MttA' Concert Rehearsal!! Message from the Chairman, Sam McCarthy. Please can we all make a concerted effort to be at Rehearsals on time to start prompt at 7.30pm. If you are going to be late or not make it at all, which we all know can happen sometimes, please ensure you contact one of the Production Team. JatB: Act 1 Scripts Down Date. If not before, all scripts must be down for Act One on TUES 13 NOVEMBER. 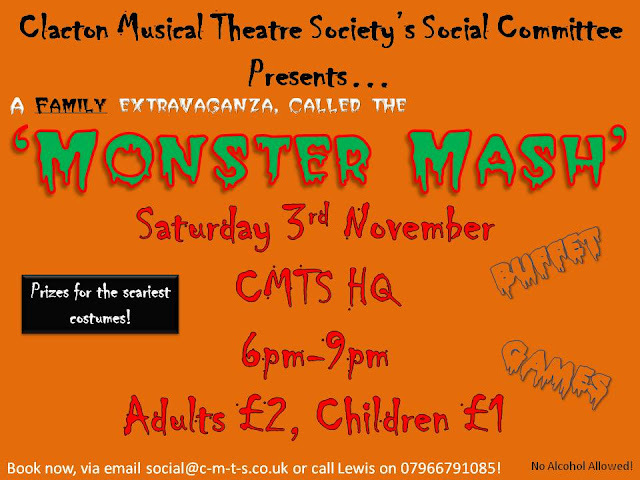 CMTS Halloween 'Monster Mash' Party! The Management Committee are pleased to announce that Jean & Neil Murphie have been bestowed with Honorary Life Membership of CMTS. 'Music Through The Ages' Youth Performers Concert Information. Venue: CMTS HQ. 14 Brunel Road. Clacton-on-sea, Essex. CO15 4LP. Costumes needed for next Fridays rehearsal, also Friday 26th October everyone is needed from 6-9pm. Tickets: Adults £4. Kids 12 yrs & under £3. Please insure that on the Sunday your child brings a packed lunch however drinks will be provided free of charge as usual . We have put in a two hour break between the last two Performances so Parents can, if they wish, take their Children home for dinner. Otherwise they can stay at the HQ. Any queries concerning costumes, could you please contact Rachel Mccallum through Facebook. JatB Rehearsal Thursday 18th October 2012. JatB Rehearsals: Sunday 21st October 2012. A reminder that there is a Rehearsal this coming Sunday, the 21st October. From 11.30am to 1pm - Full Company called. 2 to 4pm - Full Company called to run Act 1. If you are unable to make any Rehearsals, please ensure you contact one of the Production Team asap. Thanks. Upcoming Events from CVS Tendring. The next Clacton Lions Quiz Night is being held in St. James’ Church Hall, Tower Road, Clacton to raise funds to assist with their Centenary celebrations in 2013. Doors open at 7.30 for an 8pm start and teams of 4 to 6 people should bring their own refreshments or better still prize winning picnics. Whether you are an Egghead or have never found your Secret Fortune, there is something for everyone in this Quiz. Following on from this Quiz is the annual Christmas Quiz being held in the Princes Theatre for the Chairman of Tendring District Council’s, Cllr Danny Mayzes, charities. This is on Friday 30th November. Bookings now being taken on www.quizline.org.uk . The MS Society Clacton Branch are holding a Race Night on Sat 3rd Nov at 7pm at The McGrigor Hall, Fourth Avenue, Frinton. Tickets in advance cost £8.50 and include a cheese and crackers supper with a free glass of wine/soft drink. For tickets please contact Linda 01255 318515. Promises to be great fun! There has never been a better time to improve your English and Maths skills. Adult Community Learning is running a free class at Soken House, The Triangle Frinton on Sea. By improving your Maths and English skills you can improve your job prospects, help your children with their homework, improve your confidence with everyday tasks and progress onto further training opportunities. The classes are run on Friday mornings from 9.30am-12.30pm. For tonight's Rehearsal, the Full Company is called. Thank you to all those Members that attended the AGM last night. Unfortunately no one has put themselves forward for the role of Fundraising Committee Chairman. If any Member is interested, then please speak to one of the Management Committee. We are also pleased that Edna Mountstephen was voted in again as our President and Michael MacLean as our HQ Manager. JatB Rehearsal: Thursday 18th October 2012. Due to unforseen circumstances someone has had to drop out, and we desperately need a young or youngish man to play the part of John, one of two footmen. Not a huge part, but he has several lines, and would hopefully also be able to take part in the group singing. CADS rehearse on Mondays at CMTS HQ, and on Weds at CADS HQ which is literally just round the corner. 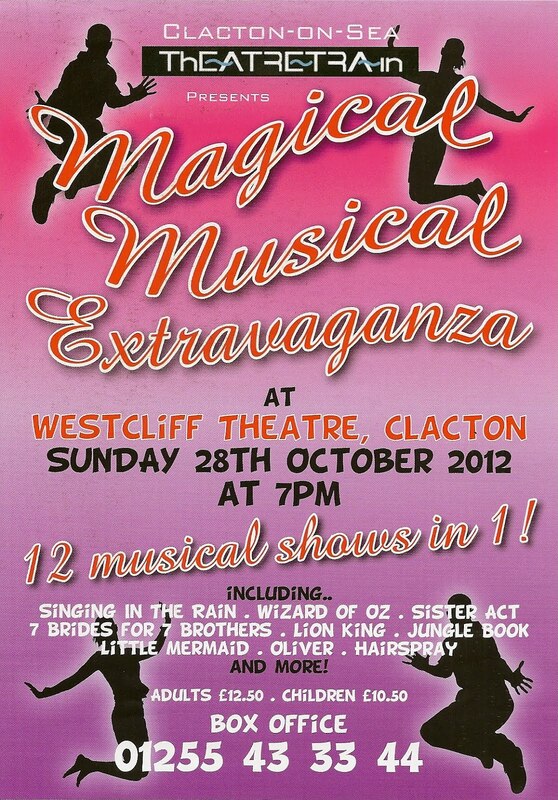 There is a rehearsal this Sunday (07.10.12) at Great Clacton Community Hall (Near the Ship Pub in Valley Road) and another on Sunday 4th November. There are a few CMTS Members taking part in in the community singing, so you will not totally be among strangers! One of the most successful British films of all time can now be seen for the first time in Southend live on stage in this brand new production of the Broadway and West End smash hit musical. Six unemployed steelworkers are miserable. They have no cash and no prospects. One night they catch their wives and other women going crazy over male strippers. The six men then set out to make some quick cash by staging their own strip show with one key exception, unlike the professionals, they will go “THE FULL MONTY” As the guys work through their fears, self-consciousness and anxieties they find strength as a group and overcome their inner demons. All the characters, laughter and tenderness of the film that the whole world fell in love with are brought to life in this triumphant stage musical. 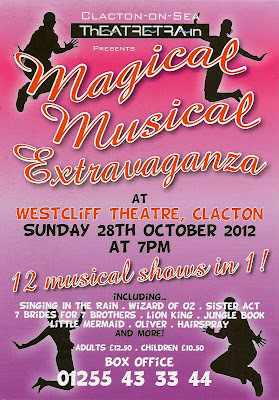 Copyright © *2012* *LEIGH OPERATIC & DRAMATIC SOCIETY*, All rights reserved. Reminder: CMTS AGM Wednesday 10th October 2012. You need to be a Member (Full, Joint, Student, Junior, Friend, Patron) to attend and be able to participate in any debates, but only Full Members are entitled to vote. This is your opportunity to have your say and stand for the Management Committee or one of the four Sub Committees; CMTS Youth Performers; Press & Publicity; Fundraising or Social. If you can not attend please inform one of the current Members of the Management Committee and they will pass on your apologies. CMTS Youth Performers 'MTTA' Email Address Issue. We are aware of the problem with the MttA email address. It is being sorted. We will post on Facebook, Twitter, Tumblr, etc once it's up and running again. Regards, CMTS Youth Performers Committee. Rehearsal tonight is to run Scenes 1 & 2, pages 1 to 9. Everyone involved is called. Thanks. 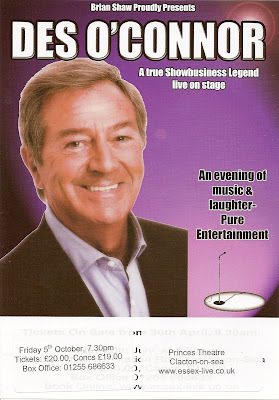 Des O'Connor at the Princes Theatre. 9 to 10pm - Called - Dame, SSimon, Jack, Miranda, Daisy, Fairy GB & Grisly. Set p.6 to 9 including 'Opposite Your Smile'.